A game-changing system designed to get you to start CRUSHING your daily PowerPoint tasks and start building better slides in the real world. Designed to Add Rocket Fuel to Your Productivity! 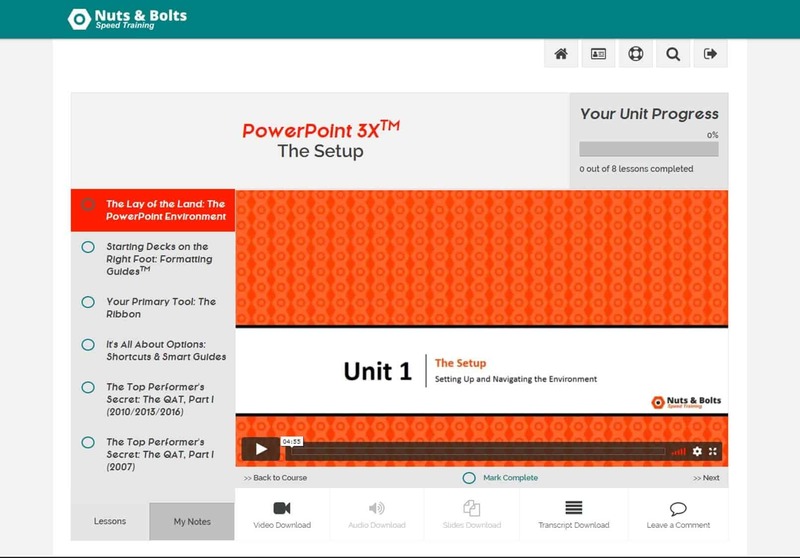 UNIT 1: The Setup (53 mins) - Learn how to leverage the PowerPoint environment and set up the exclusive Nuts & Bolts customizations to instantly double your speed in PowerPoint. UNIT 2: The Challenge Slides (2h) - Develop the strategies and techniques that will get you building any slide in fractions of the time it takes everyone else. UNIT 3: Ninja Lines (46 mins) - Learn how to align ANYTHING in PowerPoint by focusing on 'technically' impossible alignment issues that most people use guess-work to get into place. UNIT 4: Connectors (53 mins) - Learn how to solve the many inconsistencies of working with lines in PowerPoint that destroy most people's layouts (and create hours of reworking issues). UNIT 5: Boxing Things Up (1h) - Learn how to quickly build and re-haul any slide in minutes using a variety of mix and match Boxing and Implied Boxing Techniques, allowing you to quickly generate new layouts in heartbeat. Turn a Weekend of Work into Just 1.5 Hour of Work that's Superb! Just how fast can you be? When you join, you'll get immediate and lifetime access so that you can stress-free learn it at your own pace and come back to anything that you need a refresher on in the future. Over 8 hours of online video instruction, broken up into short sequenced lessons, where you build the slides along with me, developing your skills, your techniques and your muscle memory. The videos are broken into 10- to 15-minute chunks so that you can easily pick them up whenever it is convenient for you. 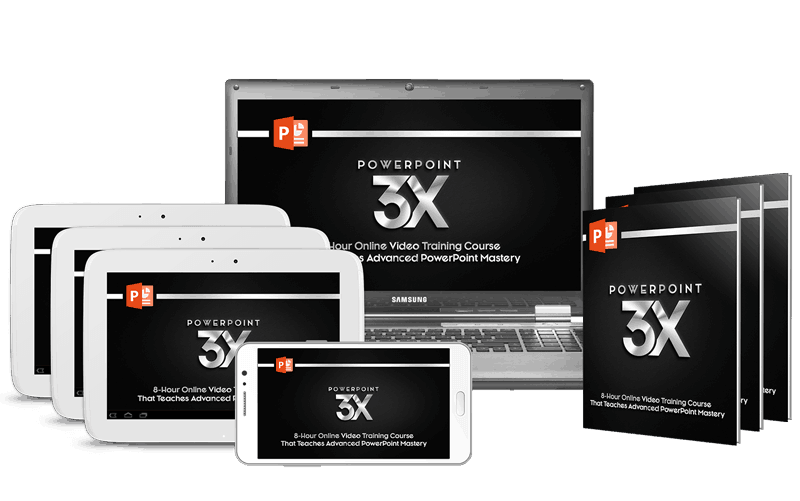 You’ll be grandfathered into PowerPoint 3X at today's price so that you get anything that we add to the course in the future FOR FREE, despite any price raises. Videos, exercise decks, transcripts, and sample slides... it's all there for you to download. While you watch the training videos, you can follow along using the blank and completed exercise decks. Download and install our special PowerPoint 3X Quick Access Toolbar into your version of PowerPoint. 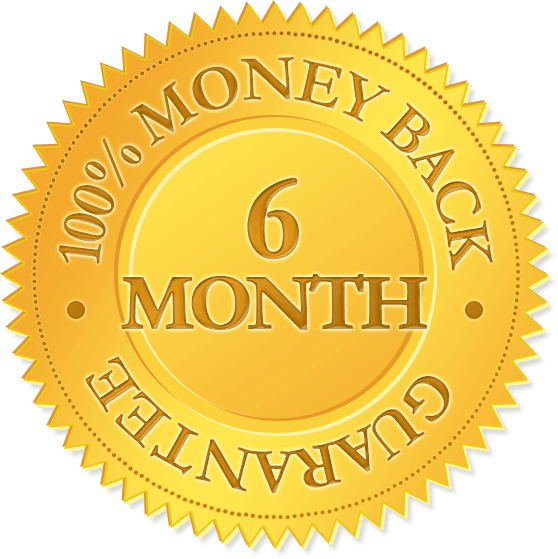 You have 6 FULL MONTHS to watch all of the material to make sure it works for you. 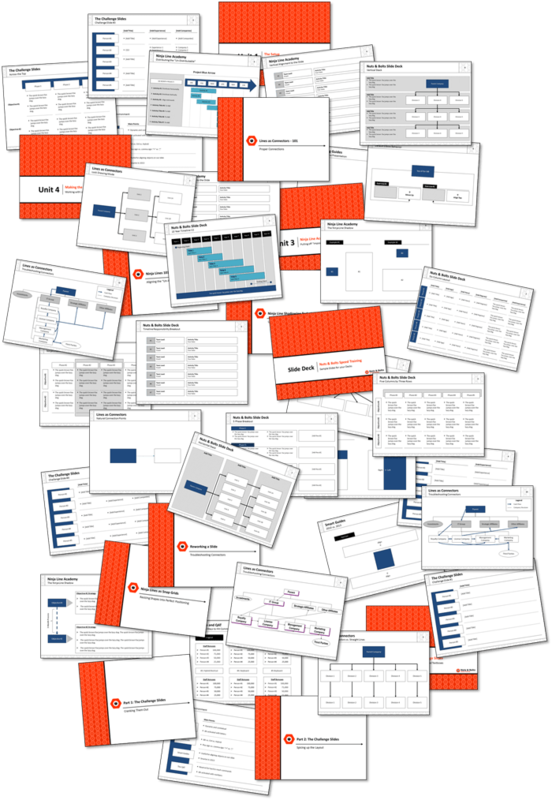 The Bullet Busting Mini-Series and 50 plug-and-play slides, so that you can quickly turn long lists of bullet points into visual layouts that impress your clients and colleagues. Data-Visualization Units (20 lessons), helping you power through tables and charts, and create better data visualizations. The Slide Master Survival Guide that will help me solve 95% of all slide master issues. Advanced Techniques Videos that will teach you tricks and work-arounds to allow you to create even more layout options, all while keeping both sides of your deck in mind. Thanks for your help so far, I'm really glad I invested in this course. I'm going to go through the 5 units again to help my muscle memory and get used to my QAT shortcuts.Thanks again to you both for helping me look good to the clients!" I honestly can't believe the results. In the same amount of time it previously took me to finish a single slide, now I can complete an entire presentation..."
I'd happily pay double the price for this amazing content, this is an amazing course. Although I consider myself an experienced PowerPoint user, I learned a lot through the ultra express approach that N&B teaches here. Worth every single penny!" The VP of my department asked me if I could prepare a slide for him on Friday afternoon [...] I’m sure he thought I would send him something over the weekend or on Monday a.m., but I got it to him within one hour – and yes I made it Happy Hour! I referenced the Ninja warrior approach you coached me on. I’m sure there are things that could be improved on this slide but before Nuts and Bolts, I could never have cranked that out in one hour. Also, the VP wrote back right away with one short comment: That’s superb! Thanks!" Just as an FYI Taylor and yourself have saved my presentations 3x now. So the time I spend watching is worth every ounce of investment." I told [my business partner], 'For sure, this has made me about 6 times faster.' [Just crushing all the repetitive stuff] has taken so much time out. I asked an associate to create a Gantt chart in Excel [...] and I took that Gantt chart out of Excel...there were probably 300 objects on the page. And I did that in 1.5 hours. That's a task I would never have even considered attempting. And because it's all made in PowerPoint, it looks amazing!" When you join PowerPoint 3X you get a full 6 months to test everything out. If you don't find that you've tripled your productivity in PowerPoint with the course, shoot us an email and we'll refund 100% of your investment. See What Over 2,500 Students Are Raving About, and Start Taking Control Over Your Productivity!